Geothermal Photo Contest - Your best geothermal photos can now be submitted to this year’s Amateur Photo Contest. The purpose of the contest is to showcase quality photography featuring geothermal energy around the world. Send us your best shot! Deadline is August 2. Kenya: Chinese Company Wins EPC and O&M Contracts for 35 MW Sosian Menengai Geothermal Power Project - SMGPL is building the facility in the Mennonay volcanic geothermal block in Nakuru, Kenya, and has an agreement in place to sell the electricity generated there to Kenya National Power. It already has a license to generate power from the Kenyan government. 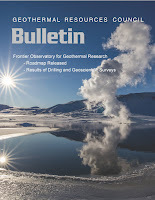 Germany: New Publications on Re-Using Oil & Gas Wells for Geothermal Energy - How can abandoned oil and gas wells continue to be used? What role can geothermal energy play in this and how can such boreholes contribute to the energy transition? USA: Internship Available for Pre-Feasibility Geothermal Study for a Site in Alaska - Cold Regions Research and Engineering Laboratory (CRREL) is offering a summer internship under the supervision of Dr. Viktoria Gisladottir. Philippines: Bacon-Manito Geothermal Power Plant to Provide Electricity for Pipe Factory- Neltex Development Co. Inc., the country’s largest plastic pipe manufacturer, tapped Energy Development Corp.’s Bacon-Manito Geothermal Project in the Bicol region to supply electricity for its factory in Dasmariñas, Cavite. Republic of Ireland: Downhole Data Confirms 260 Degrees F Offshore Geothermal Resource - Integration of seismic and well data support the potential presence of a large offshore geothermal resource (c. 7 Billion Barrels) with further upside potential. New Zealand: Mokai Geothermal Power Plant to Help Produce Hydrogen - The “green” (carbon neutral) hydrogen will be generated using electricity from stable, cost-effective geothermal energy in Mokai, Taupo, located adjacent to an existing Tuaropaki power plant (owned by the Tuaropaki Power Company and operated by Mercury Energy). Ethiopia: New Bill Eases Registration and Licensing Processes for Geothermal Development Companies - Drafted by the Ethiopian Energy Authority last year, the draft regulation categorises the resource into two sections depending on the capacity of energy. Science & Technology: Geothermal Energy Can Serve as a Sustainable and Effective Energy Source for Food Production - While geothermal energy is predominantly known for power generation and district heating, it can serve as a sustainable and effective energy source for food production by heating greenhouses and aquaculture ponds. United Kingdom: Opportunity for Deep Geothermal to Compete for Contracts for Renewable Projects - The registration process for the next allocation round under the Contracts for Difference (CfDs) scheme is now open. Germany: Deadline for Nominations for International Geothermal Association Board is Next Week - Nominations for Board Term 2020 – 2023 are now open. Get the guidelines, get nominated, and run for election.